For skiers who prefer earning their turns away from resorts, few winter pleasures compare to overnighting in a backcountry hut. No traveling to the trailhead: Just open the front door. In the Northeast hut options are limited, but hardly non-existent. 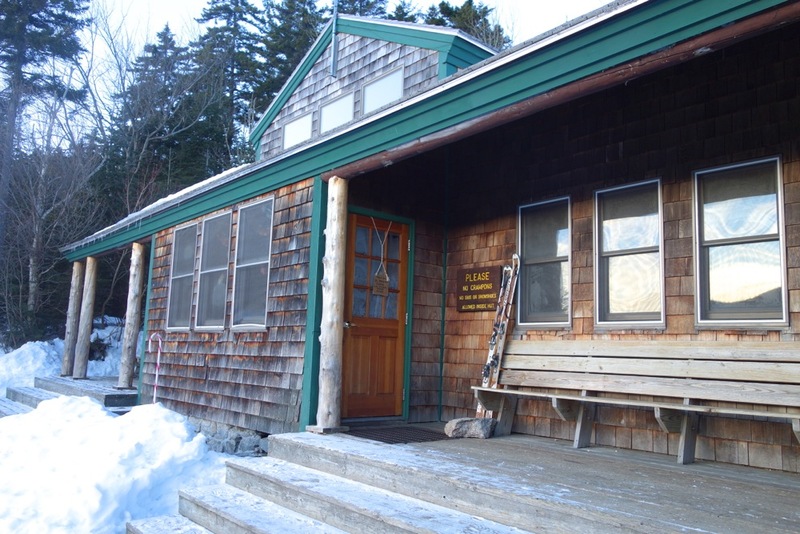 David Goodman, author of Best Backcountry Skiing in the Northeast, considers the Appalachian Mountain Club’s Zealand Falls Hut the best option for hut-based ski touring in the region. With two nights booked between Christmas and New Year’s, my party of two hit the trail in New Hampshire’s White Mountain National Forest. Unfortunately, the Grinch stole Christmas for northeastern skiers, decimating our early-season snowpack with rain and warm temperatures. Over three days along the busy Zealand Winter Trails, we were the only group foolhardy enough to attempt a ski tour – everyone else sported hiking boots with traction aids and just-in-case snowshoes that they never used. Our packs laden with the basics (food, wine, chocolate), we started on the Spruce Goose cross-country trail. It proved mostly dirt, which diverted us onto Zealand Road, a former logging road closed in winter but barely covered for the first few miles. A gradual elevation gain helped the snow cover, but the Zealand Trail, a narrower, technical hiking route, necessitated seemingly endless dicey crossings of fast-moving, unfrozen streams. The skis came off plenty and we prayed for solid footing to avoid taking a frigid plunge. As the 6.8-mile approach to the hut advanced, my threshold for unclipping my bindings dropped and I dragged my skin-clad touring skis across branches, over rocks, and through shallow brooks. They say gear was meant to be used, but I’m not sure Dynafit had this level of abuse in mind. After a final 0.3-mile push up a steep slope that I stubbornly skinned, the Zealand Falls Hut awaited. In winter, AMC maintains two self-service huts with a caretaker on site. Ian (aka Coconuts), a recent Appalachian Trail thru-hiker with a bushy beard, was just wrapping up a two-month stint as Zealand Falls’ resident mountain man where he chopped wood, cleared local trails, and kept order at the 36-bunk hut. The genial crowd shared food, played card games, swapped AT stories, and retired early to frosty bunkrooms. While a woodstove heats the living area, both sleeping quarters are unheated, which makes for an indoors winter camping experience. On our second night, the inside temperature dropped below freezing. On day two, a cold front brought clear skis and chilly weather, hardening the slush and making the limited snowpack even less pleasant for skiing. 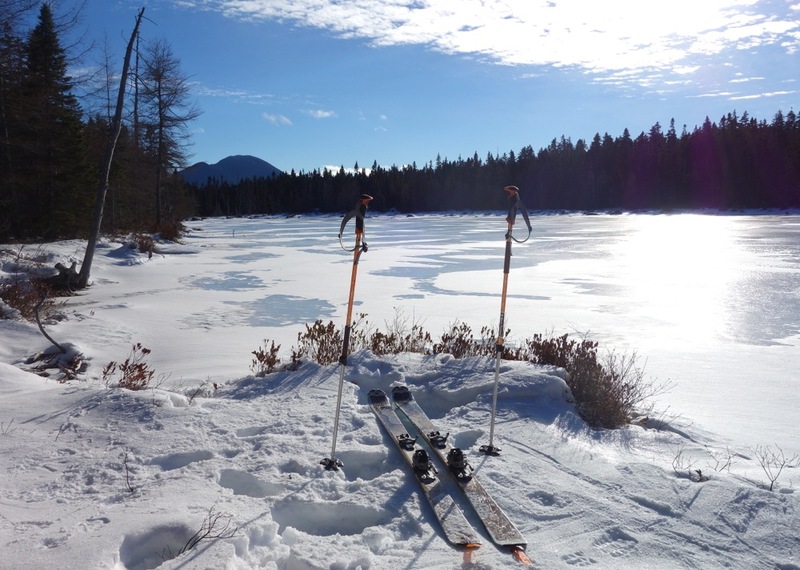 With no other option than hiking in ski boots, I strapped on my touring skis for another seven miles, a round-trip through Zealand Notch to Thoreau Falls and Shoal Pond, skirting the edge of the Pemigewasset Wilderness, a second-growth forest formerly devastated by logging. 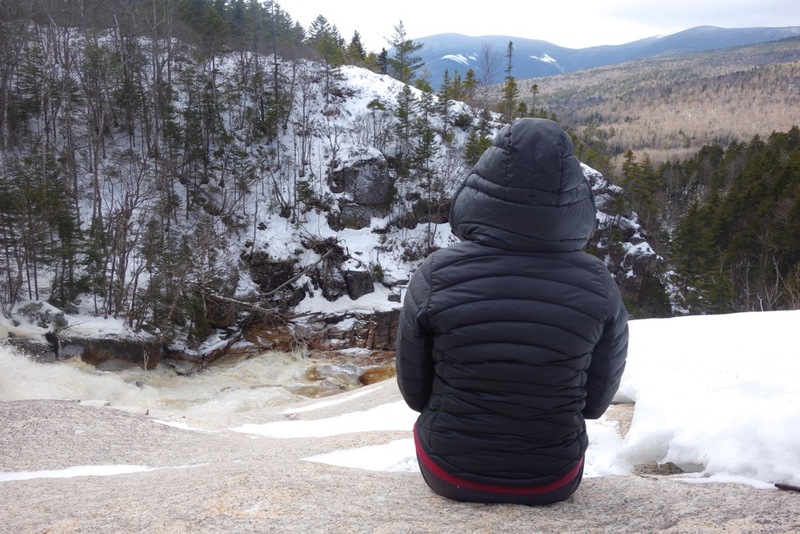 As the largest federally designated wilderness area in New Hampshire, visiting the “Pemi” was a fitting conclusion to 2014, the 50th anniversary of the Wilderness Act that has preserved millions of acres – including plenty of prime backcountry skiing real estate. In good snow years, the falls are skiable. Back at the roost, I gamely explored the “caretaker glades,” rows of broadly spaced birch that, with enough snow, would make for some delightful tree runs ending at the hut’s doorstep. 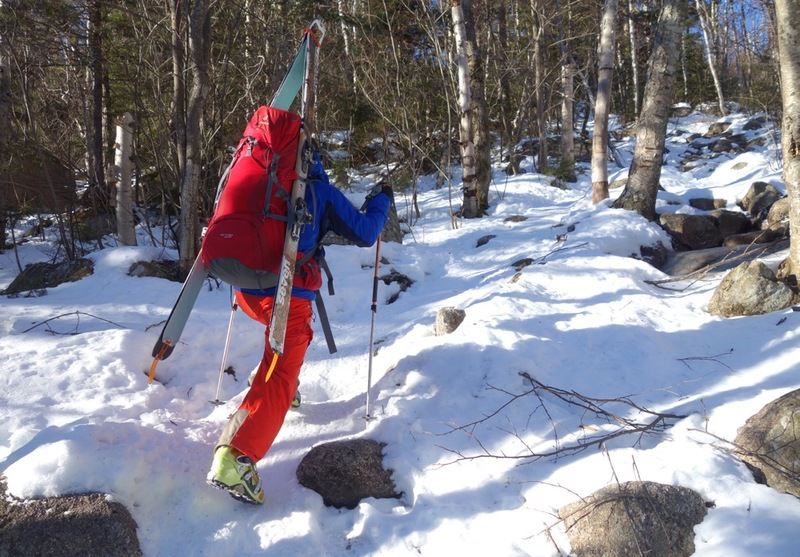 Unfortunately, the foot remaining of rock hard snow was hardly enough to cover the underbrush that made my whopping 150 vertical feet descent – having stripped my skins for the first time in 14 miles – more folly than fresh tracks. A glimpse through the trees of the Mt. Washington summit cone awash in alpenglow, however, almost made up for the lack of turns. After devouring two days and nights of meals and snacks, we retraced our steps with lighter packs, picking our way down the Zealand Trail and then along Zealand Road. 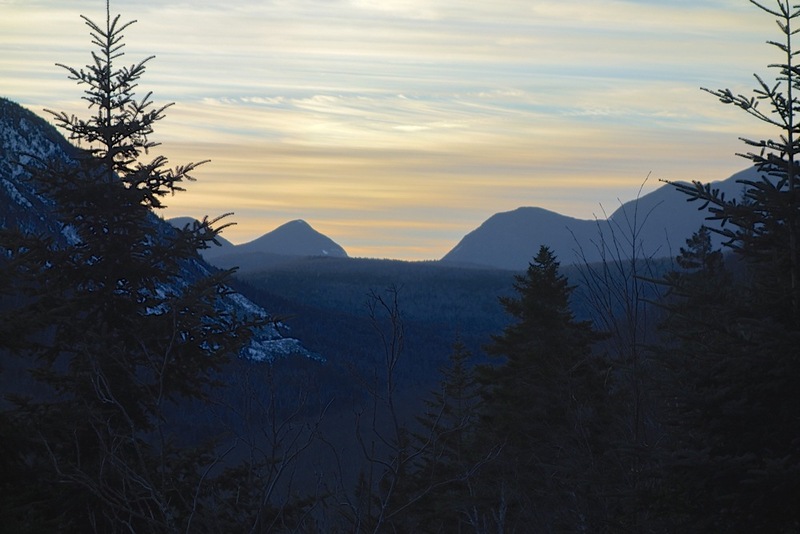 At the top of the final descent to Route 302, the Northeast’s highest peak came into view under bluebird skies. 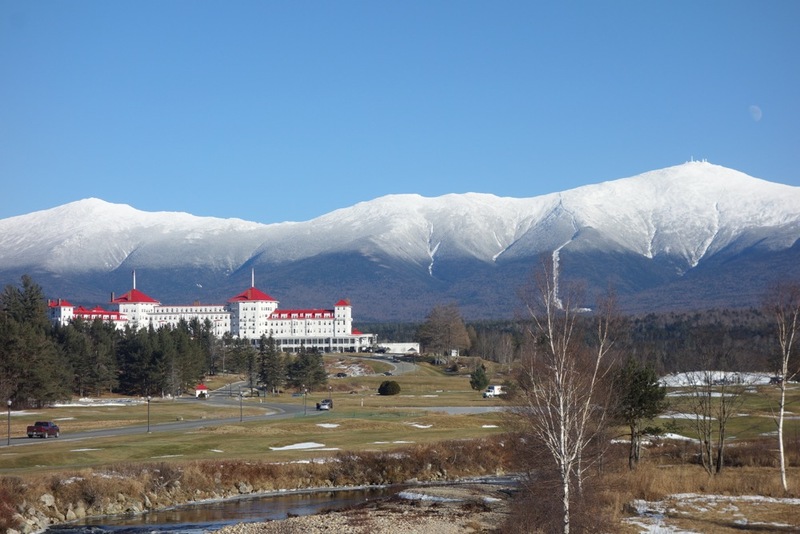 The full panorama of the Presidential Range from Breton Woods was nothing short of postcard. I can’t believe you booked that hut in December expecting to downhill ski. Natural snow is very unreliable in December. Most years there is not enough natural snow in December for backcountry touring. Despite the rain and thaw, I suspect you still saw at least average snowpack for this time of year due to the big mid-December storm. Goodman’s book almost exclusively needs to be read from a rugged touring mindset, which is what he originally wrote it as two editions ago before AT began to dominate the northeast touring world. Obviously, steeper routes can be skied AT or via slowshoeing. 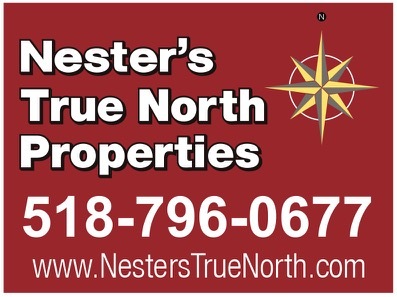 But most of his “tours” really are tours in the traditional sense, rugged touring ski style. I bet Harv would love something like this (with just a bit more snow 🙂 ). You were on the wrong side of that mountain if you wanted something downhill oriented. But there wouldn’t have been enough snow anyways. *shrug* I still enjoyed the scenery, and for the record they had three feet of snow before Christmas came through and rained it all out. A week prior and I could have easily skied the caretaker glades and maybe even from the top of Zealand Mountain. You’re correct also that Goodman describes the Zealand Falls tours as done with fishscale xc skis, no touring gear required… but since that’s all I’ve got and I’m a glutton for punishment, so be it. Like I said, it was more tour than ski, but that was ok with me. Bold plan. Tough timing. Perseverance and a good attitude. Scouting, reconnaissance, camaraderie. Happy New Year. An excellent adventure, midatlantico. Wishing you some more fine ones (albeit with better snow) from here on out. I would love to wake up and see that first view sometime. Almost Yosemite. What a great place.